The event that led to the establishment of a real national army was the accession to the throne of Charles of Bourbon in 1734, although in the first decades the core of the forces was constituted by the gift made by Philip V, who gave half of the Spanish army and almost all Spanish artillery (about 30,000 men belonging to infantry and cavalry; after the conquest of the Kingdom, only 18,000 of them remained) as a present to his son. Their Captain General was the Spanish Duke of Charny, and only in 1740 was the Neapolitan Francesco d’Eboli, Duke of Castropignano, appointed to this position. However, Charles started to recruit and train so-called “national” units, so that already in 1744 the “national” regiment of Terra di Lavoro stood out in the battle of Velletri against the Austrian forces. Concerning the navy forces, Charles did not find any vessel, since they had all been given to Emperor Charles VI by Marquis Pallavicini; therefore he immediately began the construction of his fleet, also moved by the need of protecting the kingdom from the attacks of the Barbaresques. 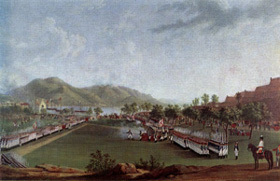 Charles began his military reconstruction by establishing Institutes to train officers, such as the “Real Academia de los Guardias Estendartes de las Galeras”, established on 5 December 1735, and followed in 1745 by the ‘”Artillery Academy” and in 1754 the”Academy of the Military Engineers Corp”. The first reforms were made during the early years of the Kingdom of Ferdinand IV. In 1765 the burdening Spanish regulations were modified, all regiments were put on an equal stand, and the “Corse” regiment was suppressed. In 1769 the Royal Artillery Academy was merged with the Engineers Corp to form the “Royal Military Academy”, located in the Panatica building at Santa Lucia. 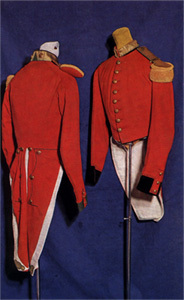 In 1771 a Corp of Selected Cadets was established and called “Ferdinand Royal Battalion”, whose colonel was the Sovereign himself. This was not enough to satisfy the King’s idea of a complete training for young military people. 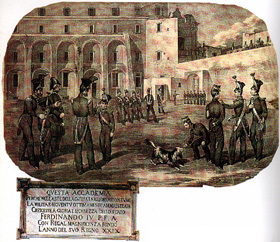 In 1774 a general reform was implemented foreseeing the suppression of the “Royal Military Academy” and the reorganisation of the “Ferdinand Royal Battalion”, that had to include cadets from all armed forces. The Battalion was therefore named “Royal Academy of the Ferdinand Royal Battalion”, and the cadets increased from 270 to 810 and from three companies to nine companies. 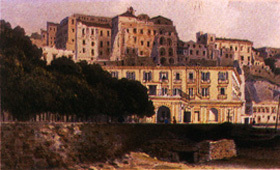 The elder were housed in the former Franciscan monastery that had later become the palace of the Prince of Salerno (present seat of the Command of the Southern Military Region), the underage were housed in the Panatica building at Santa Lucia. 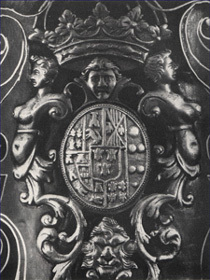 The “Royal Pagers” were established by Charles at the beginning of his kingdom to educate the young people that had to serve at Court and the “Military College”, established to educate the youth to the elements of military art. Only when Acton became Prime Minister were the first great reforms of 1786 and 1788 launched. Acton paid more attention than Tanucci to military questions and the reforms marked the definitive emancipation from the Spanish influence. Some foreign regiments were abolished and the distribution of officers and petty officers among the different regiments became homogeneous. Further reforms involved the Infantry (armed according to the Prussian model) and the Cavalry (whose dragons were abolished), that formed 14 brigades, in turn divided into 7 divisions. The Artillery was organised according to the French model. 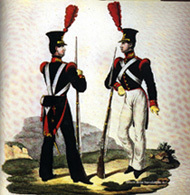 By Charles’ “Prammatica” of 1796 foreseeing a new form of recruitment, the army was divided into 20 Infantry regiments. Every national regiment included 600 soldiers from the provincial militia, each group divided into 3 battalions. In war times, each regiment was made by 1700 men. Each cavalry regiment was formed of 4 squadrons and half squadron as reserve (a squadron was made by 142 men, of which 120 were mounted soldiers). The General Staff and the lower ranks were formed of 21 men. Each artillery regiment was made of 2 battalions divided into 4 brigades, each in turn formed of 4 battalions, in turn divided into 4 companies of 51 men each. In total, the armed forces moved from the 34,000 men of Tanucci time to 58,000 men, including provincial forces. Acton took also care of the fleet. 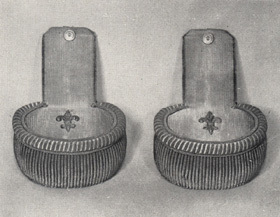 In 1799, the fleet was made of 28 “Square Vessels” and 120 “Light Vessels”. During the Championnet invasion on 8 January 1799, by order of Nelson this fleet was completely burned in the Gulf of Naples in order not to deliver it in the hands of the enemy forces. 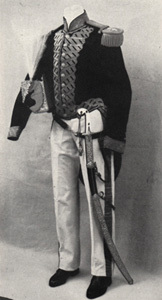 After the French rule, Ferdinand (who now had become Ferdinand I as King of the Two Sicilies) wanted to act cautiously and just changed the name of the “Royal Polytechnic and Military School”, founded by Murat, into the “Royal Polytechnic and Military Institute”. After the Restoration and the unification of the two Kingdoms into a single Kingdom called “Kingdom of the Two Sicilies”, the Neapolitan and Sicilian armed forces were completely united. In those last years of the rule of Ferdinand I and then under the rule of Francis I, the main concern was the reconstruction of the fleet. The military institutes also underwent some changes. 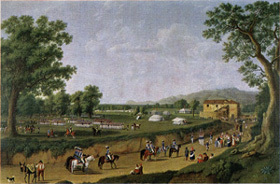 On 1 January 1819, a new regulation was issued and foresaw three institutes: the “Royal Military College” located at Pizzofalcone (Nunziatella), tasked with the training of artillery, engineering and Staff officers; the “Royal Military Academy”, located at San Giovanni a Carbonara, tasked with the training of officers for all other Corps and preparatory school to the “Royal Military College”; the “Military Schools”, that had to provide petty officers and be used and preparatory schools to the “Royal Military Academy”. 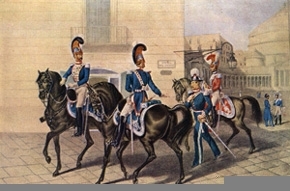 In 1821, after the risings of the previous year in which some officers had an active participation, Ferdinand I decided to repeal the regulation of 1819 and only the “Nunziatella” remained, although considerably reduced and “controlled”. In all sectors, things radically changed with the accession of Ferdinand II to the throne in 1830. ROYAL ENGINEERING CORP: Topographic Office, 1 Pioneers, Miners-Hoers Battalion, Fortifications Office. In total, «the Neapolitan army reached a high level of efficiency and a large number of units, up to about 100,000/110,000 men in case of war, which protected the dynasty from all attempts of overthrowing it carried out by the liberals. When Garibaldi invaded the Kingdom, the army was formed by «More than 120,000 permanent staff, divide into Royal Guards, infantry, cavalry, artillery and engineering. It was equipped with first-rate weapons, suitably trained, supported by logistic structures of a good level». The Navy fleet was so large and modern «that the number of vessels (more than a hundred, divided into large-size, medium-size and small-size vessels), its total tonnage, its percentage of steam vessels and power of fire made it by far the first military fleet of pre-unitarian Italian States, and also the third fleet of the Mediterranean, after the British and French ones». Besides, the units loyal to the Crown redeemed the dishonour of many traitors by their heroic resistance in the strongholds of Messina, Civitella del Tronto and Gaeta, and for many years after that, during the civil war of the South for the legitimacy rights of Francis II of Bourbon Two Sicilies. In 1782 Minister Acton sent some young officers to study «new troop regulations, the organisation of military training institutes and the most recent discoveries in Engineering and Artillery sectors». Among these officers, there was Lieutenant Giuseppe Parisi. After returning in 1785, he produced a very detailed report and a project for a new Academy «that had to contain the best of what observed and not to be the copy of any other military training institute». The King and Acton took this proposal very seriously and on 27 October 1786 Ferdinand established the “Royal Military Academy” to replace all previous military institutes. On 28 May 1787, the King decided that the seat for this institute had to be the “Nunziatella” building, seat of the novitiate of the Jesuit order. “Below you, the sea, with a view of Capri, Posillipo on the right side and the promenade of the royal Villa between you and the grotto: on the left side, an ancient building belonging to the Jesuit fathers and beyond it the coast stretching from Sorrento to Capo Minerva”». On 18 November 1787 the courses officially began. 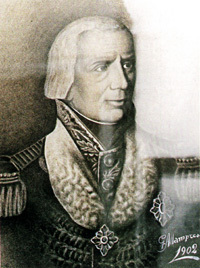 In 1798 a Royal Decree for the Royal Military Academy inspired by Parisi was passed. This Decree is described by Catenacci as follows: «of wonderful wisdom, clairvoyance, order and precision. Education, as considered in this Decree is threefold and must include body, mind and heart: this is the real education, since it is complete, not mutilated, harmonious. A love for studying is inculcated, young people are familiarised with reasoning, theory and practice are taught together with sciences, an important place is given to literature and writing; moreover, duty, loyalty and comradeship are inspired». Students were divided into 4 brigades, and there were 9 classes. The officers were organised as follows: the Academy Commander, the Vice Commandant and Study Inspector (this position was held by Parisi as reward), 1 major, 4 captains, 7 lieutenants, 7 standard bearers, 1 supply officer, 1 quartermaster and two chaplains. As concerns the faculty, it is enough to say that some of the most prestigious representatives of the culture of Southern Italy in the 19th century taught at this school. During the Neapolitan Republic of 1799 and also during the Murat rule, many officers and students betrayed their benefactors. Despite that, Ferdinand, at the time of the first restoration in July 1799 and also in 1815 during the second restoration, insisted not to close this element of pride for the Bourbons. Despite this generous behaviour, and on the occasion of the risings of 1820 and 1848, some exponents betrayed the Bourbons; but both Ferdinand I (once more) and Ferdinand II wanted to keep this College open. The latter moved it to Maddaloni in 1854, but then in 1859 Francis II moved it back to Pizzofalcone upon request of Filangieri. 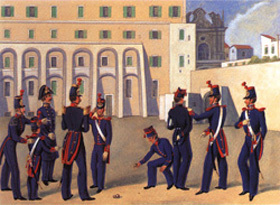 The events of 1860 up to the resistance of Gaeta dramatically marked officers and students of the Nunziatella. If some decided to betray their Sovereigns and benefactors, in reality the majority remained loyal to the dynasty and many of them went to Gaeta to fight heroically and tragically together with Francis II and Maria Sophia.